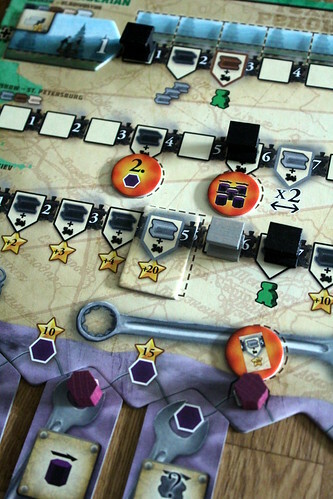 Railroads must be one of the most common themes for boardgames, even when they are not the classic train games of placing rails on maps. Russian Railroads is one of those games, its theme is building railroads through the vast expanses of Russia, but its mechanics are those of a pure worker placement game. 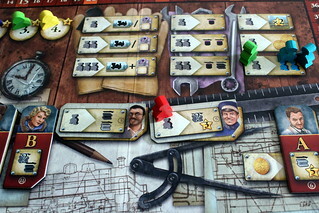 The players take turns placing worker meeple on the action spaces, most of them on the shared game board, and executing the associated actions. They are working on three tracks connecting Moscow to other important cities, two shorter ones to Kiev and Saint Petersburg and the legendary Trans-Siberian Railway to Vladivostok, the longest railway line in the world with more than 9.000km. That’s a lot of work you have ahead of you, but at least you don’t have to compete with the other players over completing the tracks first. Each player builds their tracks on their own little board, with no interference from anybody else. But that’s not all that bad, you still have enough to worry about to make all the moving parts in this game fit with each other. To start with, you not only have to worry about how far your tracks go, you also have to build them in the best possible quality. You start out building black tracks, which is pretty much cardboard tracks held together by chewing gum. But once those are in place, you can upgrade them first to gray, then brown, beige and finally the white ivory tracks with massive gold nails. But you have to build all of them in order, meaning that on your linear tracks, the gray marker can never pass the black one and so on. 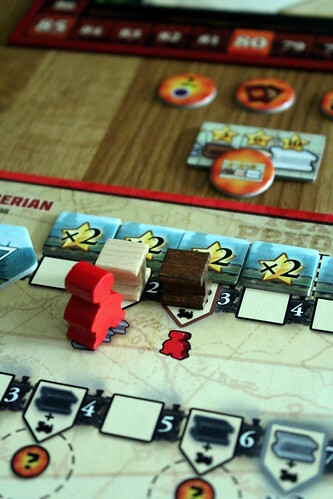 Upgrading your rails as much as you can is important for scoring points after each round, when all players placed all their workers. Black rails are worthless then, gray ones score at least one point, but every space that you reach with your white rail is worth seven points, even ten with a special upgrade. But before you can even get access to those upgraded rails, you must advance your basic black rails along the Transsib. Only when you reach the right spaces there can you build better rails. Quality over quantity may look good on paper, but you need quantity before you can build quality in this one. Seeing how many different types of rails you have and how important they are, it’s no surprise that more than half of the actions you can place your workers on are only to build rails. It sounds a bit over the top, but for each color rail there are are two actions to build them, a cheap one for one worker and a slightly more expensive one for two workers that lets you move your marker an additional space to compensate. There’s also one action space that allows you to move to spaces with any of your markers, but that costs one worker and one of the more valuable coins. Very soon, you’ll be happy about having all those actions available, because each can only be picked once per round. Once there are workers on the space, no one can pick it again until next round, so be happy you have the space, especially in a four player game where space on the main board is very tight. But what would rails be without locomotives to go on them? In order to score your rails, you have to have locomotives going on them. You buy those with the next set of three actions. The two tracks to Kiev and St. Petersburg can have one locomotive each running on them, and they score points for all spaces that one locomotive can reach, indicated by the number on the locomotive tile. The highest one is a nine, just enough to reach the last space you can reach with your gray rails on those two tracks. On the longer Transsiberian you can have two locomotives and add their numbers. Unfortunately, you can only ever take the lowest locomotive tile still available, and each number is available once per player. So you can either take and discard a bunch of useless locomotives – not efficient, even if the five-year plan says that locomotives must be produced – or you can upgrade your industry. Makes sense, right? Better industry produces better locomotives faster. The trick to industry is that the factories you need are on the backside of the locomotive tiles. When you take a tile, you choose if you want to use it as a locomotive or a factory, turn it to the right side and place it either on one of your railways or on the industry track. The industry track is basically just another scoring track, but there is twist to it: it has gaps. The industry marker can not jump over those gaps, you have to fill them up with factories first in order to advance here. Factories just happen to fit into those gaps, they add another space to the industry track and you can move your marker across to higher scores. But there’s more to those factories, they also give you a special action when you move your marker onto them. Things like immediately placing another factory or locomotive, or scoring the value of your best two locomotives in victory points. Things you really want to do. If you hadn’t guesses, moving your industry marker is yet another thing you do by picking the right actions. The third big chunk of available actions goes to the engineers, the clever women and men planning your railways. Okay, actually, they are not all that smart in Russian Railroads. Or maybe they are, but they don’t really get to show it. Engineers add two changing actions to each round. While that’s nice, the really cool thing about them that one engineer is for hire each round, and if you hire her or him for the low price of one coin, that engineer’s action will be available only to you until the end of the game. Their actions are mostly not all that special, they are very similar to actions always available on the board, sometimes with a few victory points tacked on. But their purpose is not to supply you with great, unique actions, it’s to make actions that no other player can take away from you. Also, having the most engineers at the end of the game gives you a pretty decent point bonus. Finally, there are some miscellaneous actions concerning player order – moving sooner is obviously better – hiring temp workers for the round and taking money. Money in Russian Railroads is applied communism: a worker can collect it by simply showing up, it doesn’t have anything to do with your trains being one time or silly things like that. Workers shows up, takes two coins, end of transaction. On the other hand, money in Russian Railroads is also applied capitalism, at least of the sort people in suits and ties tend to talk about: it can replace workers. Instead of putting a worker, you can always put a coin for the same effect. The final action is theoretically boring, taking it places a point doubler on your Transsib track, and to exactly no one’s surprise, a point doubler doubles the points you get from the space below it. That’s the way you score high with the Transsib, you get your high quality rails in the game and then you double their value. The same strategy doesn’t apply to the other tracks, however. They don’t even have spaces for the doublers. The Kiev route works differently, here you mostly score points from the bonuses you get for having black rails and a locomotive, the only place where black rails score. St. Petersburg has a different mechanic yet again, there you want to get the gray rails and a locomotive to space seven to double the complete score for that track. As an added benefit, there are two spaces there that let you play one of your bonus markers, easier to reach than the others spaces that let you do that. Bonus markers have powerful effects on your game, and you really want to pick the right ones for your strategy. One lets you move your science marker five steps forward, another makes four moves with any rail marker. Those markers can also greatly improve your score, one of them increases the value of your tracks – that’s how you get ten points for every space you moved your white rails – and another, the Kiev Medal, scores an incredible 20 bonus points for the gray rail on the Kiev track. What you can see in all of this is that the different areas and mechanics are intricately linked and connected. To score points on one track, you have to advance on another to unlock better rails, which is easier with the additional workers from the third railway and the right factory actions from the industry track. Oh, and picking the best bonuses for the bonus markers comes into it, too. Everything somehow advances something else you can do, and to play well you have to insert a crowbar somewhere and figure out where to start. Because, on the other hand, there is no way you can do everything you want in one game. Getting to Vladivostok and scoring proper points from it doesn’t leave you time to complete the other tracks and invest in industry. It’s just about possible to get your industry track to the end while also reaching Kiev and St. Petersburg, but then you don’t upgrade your rails much and have to find another way to score points. Of which there are a few, but will you score more using them than your opponents? It’s definitely possible, the different ways to score are very well balanced and there are many different ways to win. Completing the Transsib is the most obvious, but other strategies can score just as high, it’s really a matter of execution. That’s the beauty of Russian Railroads, where many optimization games have things that you necessarily need to win, in this one you can concentrate on some thing and omit some others and still figure out a way to make it work. Sometimes you have to rely on your opponents for that, if you’re not building industry someone has to get those small locomotives out of the way for you. It’s a subtle interaction, but it’s there, and it’s not as negative as snatching the actions the other players need. Which the other players definitely will do, because that’s the only real way to stop someone from scoring even more. If there is one thing for me to complain, then it is – yet again – the low level of interaction. 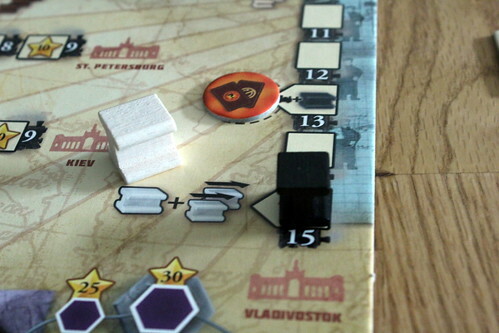 Russian Railroads is like clockwork, it has many moving parts that all somehow fit together. Also like clockwork, its a bit overwhelming the first time you look at it because of all those parts. But unlike clockwork, you don’t need a three year apprenticeship to understand what’s going on, two or three rounds of your first game are enough. The learning curve is much less steep than it appears at first, on your second game you will most likely be able to come up with an effective strategy, although you will need a few more games to really score high. That’s rather cool, for a game that is still interesting many plays later.